From my mother, piety and beneficence, and abstinence, not only from evil deeds, but even from evil thoughts; and further simplicity in my way of living, far removed from the habits of the rich. This certainly runs counter to the goal of “partying like a rock star,” doesn’t it? As an emperor he surely could have lived the opposite of all of these points. Other emperors did, both before and after. But that wasn’t Marcus Aurelius’ style. He didn’t need that excess / debauchery. He didn’t see how that allowed him to accomplish what he really wanted out of life and allowed him to live a fulfilled life. By the way, this isn’t the only reference to living simply and avoiding the trappings of the rich that he gives in the “thank you list.” So if you want to “live like an emperor,” give some thought to Marcus Aurelius’ words. This is a bit of advice I see mentioned a lot and the reason it’s probably so often recommended is we are bad about following it. As a goalkeeper I learned early on the need to prepare my gear well before a practice or game. There’s nothing like going into a practice with but one of your two gloves and the coach announcing practice on penalty shots! As a member of a marching band and then later a military band, I learned early on the importance of having the uniform ready the night before, the music sorted and prepared, and my instrument ready to take out of the case, tune up, and play. 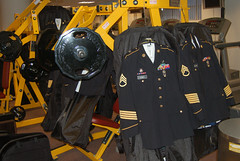 As a member of a military college where inspection happens every morning, I learned immediately the necessity of having the uniform prepared the night before. Given perfect circumstances, we’ll have plenty of time to get everything ready before we need it. In reality, that is rarely the case. For instance, how many of us have been in the situation where we put something off until the morning, head to sleep because we’re tired, and then promptly turn off the alarm and go back to sleep when morning comes? Some others play the snooze button game. In either case, it means when we bolt up, realizing it’s much later than we anticipated getting up, we don’t have that precious time to get everything ready to how we’d like it. Also, in the rush to get ready we may forget something important. Ever walk out of the house without your wallet because it wasn’t where you normally put it? So have I. By preparing the night before, this type of mad scramble is avoided. For instance, the simple act of ensuring everything is in place would lead us to look for and put our wallet where we’d expect it in the morning. If it’s right there with the car keys we need to drive to work, then there is less of a chance that we’ll forget it. Also, if there is an issue, we discover it during that preparation time, when we have an opportunity to do something about it. Waiting until the morning may mean no time. For instance, when I pulled out the pair of slacks I wanted to wear to work today, I noticed some loose strings around the belt loops. They weren’t bad, but by having pulled out the pants last night, I was able to take nail clippers to those strings, making the pair of pants look better for it. Select work slacks. Look over and correct any issues. Hang up on bathroom door hook. Select button-down long-sleeved shirt. Look over and correct any issues. Attach shirt stays to shirt. Hang up shirt on bathroom door hook. Select tie to wear with shirt. Hang up on shirt hanger. Locate and group together car keys, pocket knife, wallet, pens, and work badge. I didn’t have a written down checklist because this is the type of thing I need to do in order to be ready for work. I could keep one on Evernote and look it over each night to make sure I’ve done everything but this is a list that is so ingrained in me I don’t need to do so. And by getting everything ready last night I was able to be leisurely this morning since the majority of the preparation was done. For instance, I was able to pour a cup of coffee, talk a quick walk outside while sipping at my coffee, and retrieve the newspaper. I wasn’t rushed as I cleaned up and dressed. And when it came time to leave, I wasn’t scrambling to find everything I would need for the work day. Therefore, my day began better, I was better prepared, and there was less stress. At The Citadel, being prepped and ready for inspection is critical. What happens mere moments before having a uniform inspected could mean the difference between just a passing inspection and receiving “Outstanding Personal Appearance.” Being in The Citadel Regimental Band and Pipes meant we were in the public eye a lot. And one of the tricks we used is used by virtually all Citadel cadets right before they have to appear looking good. It’s a trick I still use to this day. That’s right: masking tape. One of the things that is most annoying is looking down at your shirt or coat and realizing you have “fuzz” on it. It doesn’t matter what you did 10 minutes ago, especially on dark clothing, they seem to attract those stray fibers. This is where masking tape comes in. Form a loop around your hand with the sticky side facing outward. Then just pat down everywhere. 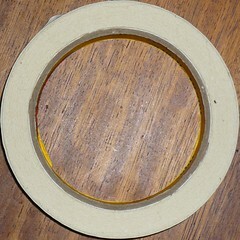 The stickiness of the tape is enough to pick up the fuzz without leaving a residue. What’s even better is if you have someone do this for you. The other person can get your shoulders and back, where you are not able to reach. Military haircuts leave a lot of little, tiny hair clippings that get everywhere and fast. After a haircut, the way we avoided this was to do the same trick with some masking tape and proceeded to “tape off our heads.” Again, the stickiness is enough to pick up the hair clippings, but not enough to do anything more than that. If you wear a relatively short haircut, then the masking tape can be a lifesaver especially if you have to go back to work or to something else important right after a haircut. Even if you get just a touch-up, such as when they clip the hair so your ears are uncovered, use some masking tape. It will prevent unsightly hair clippings on your clothing afterwards. Also, after you use the masking tape on the scalp, use another piece to hit your clothing. Invariably, there will always be some stray hairs that will be there. Personal appearance matters. We all know this. Yet a lot of times we don’t give it the attention that we should. As I’ve struggled with severe migraines over the last year or so, personal appearance was one of those things I did enough to be acceptable. But in thinking about my goals for this year, I realized that paying attention to my personal appearance is something I need to do. Way back when I was a Citadel cadet, one of the things I learned as a freshman (we call them knobs) was personal appearance was critical. Even if you didn’t think much about it, you were held to a high standard. And meeting that standard was critical to avoiding unwanted attention from prowling upperclassmen. Being in Regimental Band, our standards of personal appearance were further raised by the Director of Bands, Major Herbert Day, USMC, Retired. Major Day passed away last year, and his death made me think a lot about what I learned from him. One thing I remember was he was always impeccably dressed when it came time be on campus or at a performance. No one looked sharper than Major Day. He set the standard for the rest of us, whether he realized it or not (and you can bet he did). 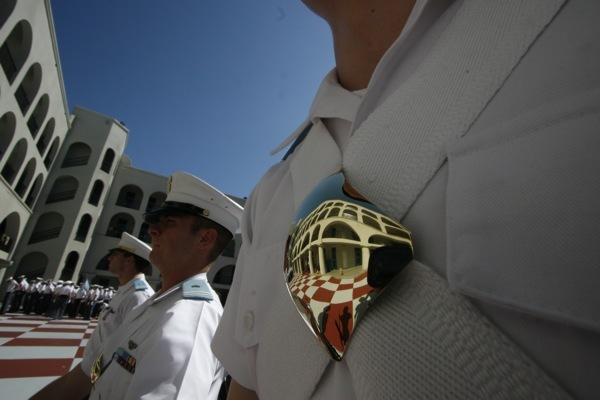 Our standards were high because we represented The Citadel. We prided ourselves on being one of the toughest military schools (not just a tough college/university, but tough even by the standards of other military colleges) in the United States and in the world. And part of that was how we looked, how we took care of our uniforms, especially in the public eye. The difference between us and others was readily apparent when I went to officer training for the US Air Force. Preparing to come back from survival training (2 day introduction), we were all waiting on the buses to come get us. While we waited, there was a circle of us blitzing down our boots. The majority of us were Citadel. Some others were VMI and Texas A&M. All military school cadets. Other officer candidates looked at us like we were crazy. First off, we brought shoe polish into the field. Second, we were actively working to get all that dirt and grime off our boots after being in a desert climate for two days. Third, that we weren’t just trying to clean off our boots, we were bringing them back up to a mirror shine. And fourth and finally, that there were so many of us, most of us from the same school, all gathered around like this was expected. They may have made fun of us before the buses got there, but they weren’t laughing when they got off the buses. The shoe was on the other foot. Those of us who had blitzed for the inspection we knew was coming were left alone. The rest were lit up. We knew the game. We came prepared to play. As a cadet, I didn’t have the highest of personal standards. I’ll readily admit as a sophomore private I flirted on the line of getting pulled (being written up and getting punished) for poor appearance. I was a dual technical major and I had told myself I didn’t have time for that nonsense. Boy was I wrong. I learned this lesson my junior year when I was selected to train the incoming freshmen as a member of the cadre. The rule about being on cadre is your uniform is always perfect. If that means having four pair of perfect shoes, you do it. If that means using Scotchguard on the inside of your shirt so no sweat shows through on a hot Charleston summer day, you do it. If that means it takes you five hours to get a scratch out of your brass belt buckle, five hours will be spent, plus the additional time to get it smooth. The Cadre are the standard for the knobs. And you lived at that standard for two months. It was hard. But one of the things I took from it was a sense of pride at my personal appearance. It altered my attitude and my outlook. Point blank: it makes a difference. And that’s a lesson I keep forgetting over the years, like the last year, when I did enough, but didn’t do my best. Polo shirts, khakis, and regular dress shoes were my typical attire for work. Polo shirts, dress shorts, and indoor soccer shoes were my typical attire for church (I’m a youth pastor and I lead games). That wardrobe selection is acceptable. It isn’t outstanding. And that’s why I realized I needed to change, to go back to the thinking I had during Cadre. Wednesday was really the start of that. To church revival services I wore a button-down, long-sleeve shirt that fit me well along with a decent pair of slacks. I pulled my hair back properly into a ponytail (growing it out for Locks of Love again). I still wore my indoor soccer shoes, because I need to get a pair of leathers like I wore at The Citadel and in the USAF. We should hopefully fix that this weekend. Last night I began the process of replacing my wardrobe with upgrades in shirts and slacks. That will be something that’ll take me the next two weeks to do. But it will be worth the time spent. Another important thing I did was I went through my closet and I pulled out everything that doesn’t fit the image I have in my mind’s eye. Every bit of clothing I pulled out is in good shape and wearable. The majority of them are polo shirts that can be worn in a business casual setting. Some were long-sleeved shirts but they weren’t what I was looking for. I’ve sorted them by those shirts with corporate/event logos (I have a lot of them) and those without. Some places won’t take clothing with the logos, hence the separation. While they don’t fit what I envision, they are all serviceable and acceptable in a professional setting. So I will donate them so someone else who needs them can get to them. Now I didn’t pull those clothes out to make room for the new ones I’m acquiring. I didn’t pull them out to feel good about myself for donating them. I pulled them out to make a clean break. So long as those clothes, which may seem more comfortable to me because that’s what I’ve been wearing for a while now (the business casual far longer than the last year) are in my closet, I will always be tempted to go back to them. Better to get them out of the house so I will have to focus on my personal appearance. I know what it takes. I’ve done it before. And this is what it takes.